Book your FREE consultation. 0861013945. Are you tired of excess skin around your abdomen? Tried hard to remove this but still left with unwanted folds of flab? Don't put up with this any longer. Arrange a consultation with us here at GBS Clinic Ltd today to discuss an abdominoplasty, or tummy tuck as it's more commonly known. This highly effective procedure removes excess skin from the abdominal area to give you a firmer, toned appearance. 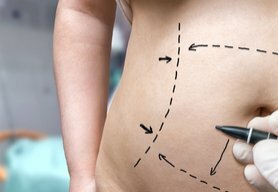 Your body shape improves with tummy tuck surgery and old scars disappear, making it the perfect solution for stretch marks, or excess skin created by recent weight loss. The abdominal muscles can also be tightened during an adominoplasty creating the appearance of a younger, fitter abdomen. Tummy tuck (Abdominoplasty) is a common procedures. Our expert surgeons are here to discuss this procedure with you to alleviate any fears you might have. If you have always wanted a flat and toned stomach but age has caught up with you, or you have had children recently and your once washboard-flat stomach has disappeared, a mini tummy tuck could be perfect for you. We will remove excess fat and tighten the skin and abdominal muscles to enhance the shape of your tummy. Book a FREE consultation today with our resident surgeons by calling us on 0861013945. Your tummy will be totally transformed with our safe, surgical procedure. 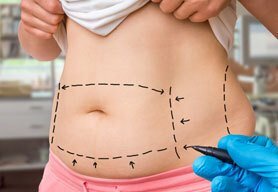 Making a small incision in the lower abdomen, excess skin is pulled inward and down, before it is removed, along with any fatty tissues that lie beneath. Muscles are tightened before the skin is carefully draped and the original incision is then closed at the end of the procedure. Afterwards, you are left with a tighter tummy and awesome looking abs! Tummy tucks are one of the many surgical treatments we provide here at GBS Clinic Ltd. We are happy to explain this treatment further when you arrange a no-obligation consultation with our expert surgeons. As part of the surgery, we usually make the incision around the groin area so it's easily covered with a bikini or swimming shorts afterwards to give you even more confidence. For more details, book your consultation with our highly qualified cosmetic surgeons today and call us for a friendly chat on 0035319081195. We guarantee the best tummy tuck prices! Want a Firmer, Flatter Tummy? Book an Appointment Today! Don't hesitate to get in touch with us here at GBS Clinic Ltd to discuss any of our tummy tuck procedures in Dublin. We welcome your enquiry and you can contact us to discuss any of the safe, surgical procedures we provide. Call to speak to us today on 0035319081195. GBS Clinic Ltd is the leading cosmetic surgery in Dublin, Ireland specialsing in breast augmentation and cosmetic services. We provide the very latest FDA approved treatments from highly trained medical staff working to the finest standards and best industry practice. Make a decision to have a breast enlargement, reduction, liposuction or non-surgical cosmetic treatment with us and you are in the safest hands. Our breast augmentation services are completed in state-of-the-art facilities with full aftercare packages provided at a price you can afford. Book your initial consultation now!